Oakland, Calif. • Before Tuesday’s game against the Western Conference-leading Golden State Warriors, Jazz coach Quin Snyder noted that his team was still evolving, and that this final game before the All-Star break would be a good way to find out just where the team stands. The verdict: There’s quite a bit to like, but there’s also still a ways to go. 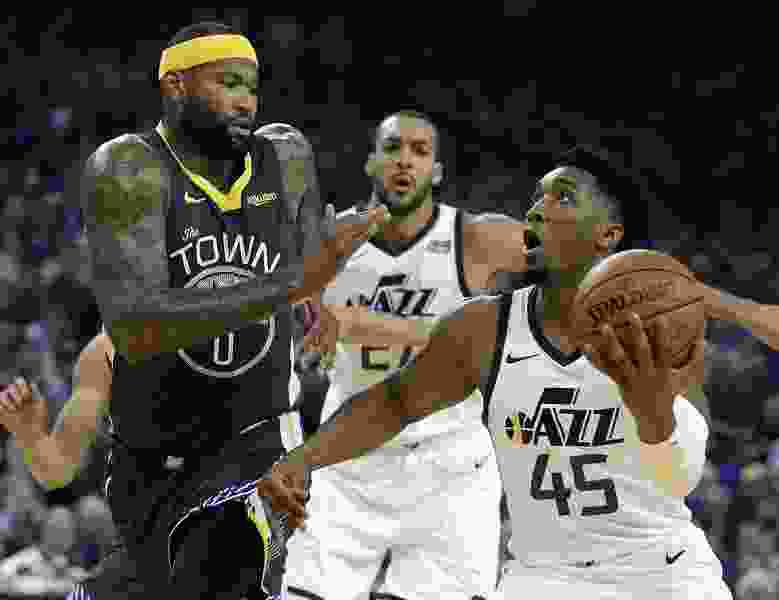 After a cringeworthy start, the Jazz got their act together — ratcheting up the defense, making some shots, even gaining the lead as the game went along, but in the end, the Warriors’ superior firepower ultimately proved the difference, dealing Utah a 115-108 defeat that dropped the team to 32-25 on the season. The opening 12 minutes at Oracle Arena saw Utah hit just 26.3 percent from the field, make zero shots from deep, and commit eight turnovers. The subsequent 36 minutes, though, nearly resulted in redemption. The Jazz have earned a reputation as one of the league’s stingiest defensive teams, and that much, at least, was on display as the game went along. After allowing Golden State players too many free runs to the basket in the first quarter, Utah adjusted in the second, enticing the Warriors into bombing away from deep — without success, as the home team made just 1 of its first 15 tries from beyond the arc. The stinginess helped the Jazz crawl back to within 36-35, and the discomfort among the home fans became palpable. Well, Steph Curry drained a 3. And then another. And then Andre Iguodala buried one. And suddenly, a game that had grown uncomfortably close for the home team had some breathing room again. The third quarter began with both offenses finding their form — Golden State making 5 of its first 8, while Utah went 7 of 11. And while the prospect of a shootout with the Warriors usually portends calamity, the Jazz actually got the better of it for a time. Utah began to surge, and a Mitchell trey at the 4:39 mark put the Jazz ahead at 67-66. They wound up making 15 of 22 shots in the third, dropping 40 points in the process and showing the Warriors that they weren’t going to go away easily. Then again, the Warriors’ prolific offensive ability didn’t disappear entirely, either. And when the avalanche finally arrived, it buried the Jazz’s chances. Utah held a 91-84 lead early in the final period, but Draymond Green got a layup, Iguodala stole a pass and ran out for a breakaway dunk. Kevin Durant hit a fadeaway. DeMarcus Cousins ripped away a rebound and laid the ball in. And two Curry 3-pointers later, and the Warriors had a 19-4 run, a 103-95 lead, and another victory pretty much wrapped up. The win was Golden State’s fifth in a row, and bumped their record to 41-15. Mitchell led the Jazz with 25 points, while adding seven rebounds. Gobert contributed 13 points, 16 rebounds, and three assists. Ricky Rubio added 16 points and six assists. Derrick Favors had 13 points, seven boards and four blocks. For the Warriors, Kevin Durant led the way with 28 points and added seven assists. Curry turned in 24 points, and Klay Thompson overcame a dislocated finger to add 22. And they all combined to make the difference when it mattered most.